The new Venture Bros. 3 3/4-inch action figure line is a massive pursuit, so Bif Bang Pow! is teaming up with Entertainment Earth and EE Distribution in order to make this project happen. Your pre-order for these characters has never been more important! We need to hit a certain number of pre-orders before we can throw the switch for these figures to start production, and that's where you come in! Just pre-order the figures from this list or ask your favorite comic and toy shops to order the figures for their store. Your credit card will not be charged until the figures arrive in 2012-- provided we meet the order goal-- and then you'll be able to have been a part of Venture Industries history! These figures sport 10 points of articulation and unlike our retro action figures, are 100% original and new sculpts. The factories require a large commitment, and that's why we wanted to let you know that your pre-orders are so important to making this line a reality. These figures will not be produced unless pre-orders meet our targets. If you want Brock Samson, Phantom Limb, or even Hank and Dean, show your support with a pre-order. No character is "safe". The shape of the line is entirely within your hands! Do you want to pre-order all 7 characters? Just order this set of 5 characters plus Brock and The Monarch separately. All orders must be placed by October 31, 2011. At this time we'll tally our orders and we will make an announcement on how the line will proceed by November 30, 2011. Go team Venture! 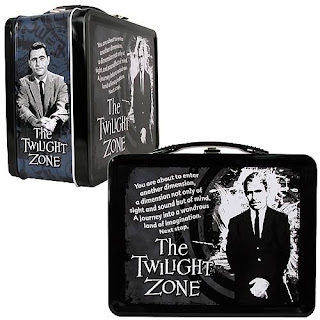 Take Rod Serling to Lunch! Technically, this is called at Tin Tote, but many of us consider this a good old fashioned lunchbox. Either way, this is Bif Bang Pow! 's first item featuring Rod Serling, and our first "non-toy" we have released. Featuring series-specific black-and-white artwork that includes the show's creator himself, it also highlights his famous opening quote any fan will instantly recognize. The metal lunch box measures 8 5/8-inches wide x 6 3/4-inches tall x 4-inches deep. It's a terrific collectible that makes a great gift for any Twilight Zone admirer! Limited edition of 1,500 pieces. Order yours today!